Chey Dee couldn’t find work in her small Cambodian village so she started looking for a job in Thailand. During her search, the 17-year-old met a man who promised a good job if she paid him 1,900 baht. She decided to go with him, even though it meant an illegal border crossing into Thailand. After two days of non-stop travel, Chey began a job roasting chicken. She was promised 4,000 baht a month, but was never paid. Her manager verbally abused her and only gave her two small meals a day. Chey found a different job, and as soon as she got her first paycheck began making her way back home. But the police stopped her while she was traveling on a bus. Because she didn’t have the correct papers, they confiscated her money and put her on a small truck to send her back to Cambodia. After returning to her hometown, Chey heard a radio program put on by Samaritan’s Purse about the dangers of human trafficking. She learned that if she ever went back to Thailand she needed the proper documentation so she could travel safely. The radio program is just one of the ways Samaritan’s Purse is combating the dangers of human trafficking in Cambodia. Our Safe Migration and Trafficking Awareness (SMTA) project has six main focuses: self-help groups, community groups, education programs in schools, radio shows, information cards, and vocational training. Samaritan’s Purse is educating and training volunteers to inform their communities about the dangers of trafficking and labor exploitation. 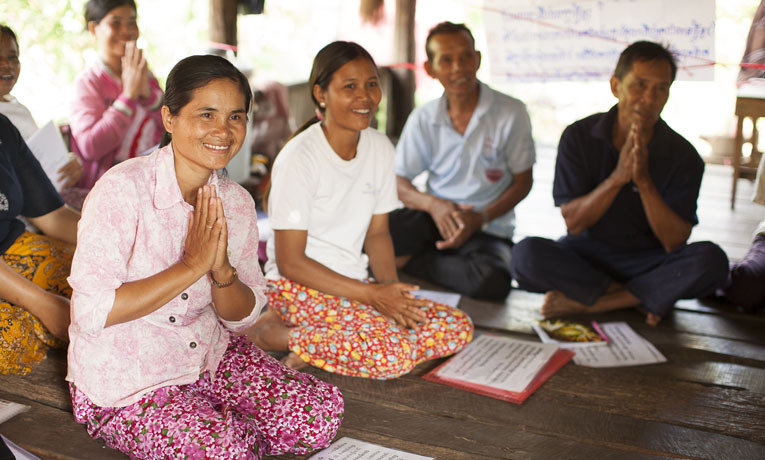 Currently, we have 240 self-help groups in 20 villages. The curriculum is Gospel-centered and teaches not only practical lessons, but also the Word of God. Eight women have professed faith in Jesus Christ through the project. Each volunteer trained in the self-help groups goes on to educate another 15 households. Naisoy Trik, the volunteer coordinator, said that the program is a means to tell people about God and His love and concern for them. Samaritan’s Purse is also educating children in 47 schools in three different districts. The lessons focus on topics such as setting future goals, making wise decisions, and migrating safely. Khea Sreng, director of one of the schools, has seen many students dropping out because they have been offered high salaries abroad, marriage proposals, and other dishonest promises. Some students have no choice as parents often push them to go abroad and work in order to send money back home. Beyond spreading knowledge of human trafficking in communities and schools, Samaritan’s Purse has handed out 10,000 information cards near the Thailand/Cambodia border this year. To further prevent people from migrating for work, we are supporting ministries that train women to make jewelry and other skills to provide an income for them locally.